Workplace bullying: what can you do? With so many cases highlighting the treatment of employees at work making the headlines recently, it is important to know your rights under the law when it comes to bullying in the workplace. Every one of us will have experienced or witnessed bullying at some point in our lives. Perhaps you remember people being picked on in the playground or classroom at school when you were a kid. Bullying is something we are supposed to grow out of. We expect adults to treat each other with respect, fairness and dignity. Which is why bullying in the workplace can be such a painful experience for victims – it is unexpected, and all the more hurtful as a result. There have been some highly publicised allegations regarding workplace bullying in the press of late, but there have also been some heartening attempts in various sectors to crack down on bullying. The scientific community is a prime example – large institutional research funders like the Wellcome Trust are making the granting of funds to research institutions such as universities and charities conditional on the adoption of their rigorous anti-bullying and harassment policy. There have also been substantial efforts to effect positive change from below, with employees and workers taking action to address cultures of bullying and harassment in their workplace – the recent world-wide Google walkouts providing a striking example. Acas provide the following examples of behaviour that amounts to bullying: spreading malicious rumours; unfair treatment; picking on or regularly undermining someone; and, denying someone training or promotion opportunities. Such behaviour can take place face-to-face, or just as commonly, via email and other electronic forms of communication in the workplace, like instant messaging. Unfortunately, bullying by itself is not proscribed by law. Harassment, closely connected with bullying, is, however. Many of the behaviours associated with harassment are indistinguishable from those that amount to bullying. Bullying behaviour amounts to harassment only if it is related to one of the nine protected characteristics designated in the Equality Act 2010, such as race or religious belief. 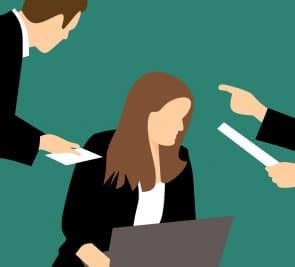 Given the lack of explicit protection under the law for the victims of workplace bullying, the onus is very much on responsible employers to put in place strong anti-bullying policies and to vigorously enforce them. What can you do if you are a victim of bullying at work? For those employees suffering at the hands of a workplace bully, there are several options. Employees should first attempt to resolve the problem informally. If you think it you may be able to reach a modus vivendi with your workplace bully by addressing the issue with them, you could try this if it is appropriate in the circumstances. Of course, you may feel that in your particular case, the chances of such an approach succeeding are slim to none. If so, or if the attempt to address the issue informally is unsuccessful, employees should consider talking to their manager, their HR department, or their Trade Union representative. If matters do not improve, the next step is to raise a formal grievance using your employer’s grievance procedure. As a last resort, if there is no improvement, an employee could resign and bring a claim for constructive unfair dismissal in the Employment Tribunal. However, to succeed with a constructive unfair dismissal claim is notoriously difficult, and employees should do everything outlined above and seek advice before considering such an option. If you are experiencing issues with bullying at work and would like to seek legal advice from employment solicitor call Hodge Jones & Allen on 0800 437 0322 or request a call back online.